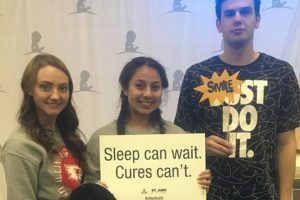 Student Alumni Council members could be seen all over campus this past year raising money and recruiting current students to be a part of the legacy that is SAC. Here are just a few highlights shared by members of the SAC executive board. SAC President Megan Cain and SACers pose at St. Jude Up Til Dawn. Six members of the Student Alumni Council participated in Illinois State’s annual St. Jude Up Til Dawn event that took place on November 10, 2017, from midnight to 6 a.m. As a group, we raised approximately $600 for families with loved ones staying at St. Jude Hospitals. St. Jude’s mission is to provide care for their patients, all while covering medical expenses so families do not have this extra burden on their shoulders. The night was full of various activities, such as fun games and heart-warming patient speeches. Our favorite game of the night was creating a “statue” by decorating one of our team members, using only random household items, such as balloons, tin foil, tissue paper, and tape. It was a truly touching experience knowing we helped hundreds of loving families during a difficult time. At the end of the night, there were multiple raffles for the students who participated in all events. The University, as a whole, collected an outstanding amount of $186,144. This money provides 186 chemotherapy treatments, 496 days of oxygen, 372 platelet transfusions, and much more. As the 2017-2018 president, I must say it has been a great year! Two of the most important events that SAC participated in this year include Festival ISU and Winterfest! These two events are our biggest opportunities for recruitment of new members. We have nearly doubled our number of SAC members this year from recruiting at these campus-wide events. I am very proud of everyone who participated and helped with both of the “fests.” One of our biggest goals for this school year was to gain more members. The new members this year have really proved themselves this semester, with three of them stepping up for leadership positions. The initiative of these new members excites me for the years to come in SAC. 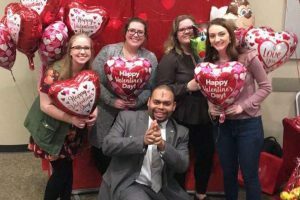 The group had great success at its first Valentine’s Day fundraiser. Student Alumni Council got into the Valentine’s Day spirit this year with our new fundraiser called the One-Stop Valentine’s Day Shop, a one-stop shop to pick up all the gifts for your Valentine. We set up a photobooth and sold polaroid photos, which was a huge hit, as well as flowers and balloons to make it extra festive. The money raised from this fundraiser went to the Illinois State Marian H. Dean Legacy Scholarship awarded to students of Illinois State University alumni. We had so much fun taking polaroid photos and spreading Valentine’s Day spirit! Overall, this was a cute and exciting fundraiser for SAC members and ISU students alike. All stories are written by members of the Student Alumni Council.